The Wilton Easy Layers contains 5 pans that are 6 inches in diameter. They are pretty shallow pans. They have a non-stick coating but I still sprayed mine with a bit of coconut oil just in case I had a problem with my cake sticking. The pans will fill up one standard size serving of cake batter. These cake pans will also all, conveniently, fit inside the oven at the same time due to their small size. AFFILIATE DISCLOSURE: THIS POST CONTAINS AFFILIATE LINKS. I DO RECEIVE A SMALL COMMISSION IF ITEMS ARE PURCHASED THROUGH THESE LINKS WITH NO EXTRA COST TO YOU. The cake itself was made with a gluten-free mix by Pamela’s. I used Pamela’s Vanilla Cake Mix. I have used this mix once before for cupcakes and I was very satisfied with the taste and texture. What I also love about the gluten-free mix is that it is non-GMO, uses no artificial colors or flavors, no preservatives, and no high fructose corn syrup. I achieved the cotton candy flavoring using a bottle of Lorann’s Cotton Candy Flavoring Oil. This was my first time using a flavoring oil of this kind and I heard that a little bit can go a long way but I ended up having to use about half of the bottle to get the flavor I was going for. I really enjoyed the flavor of this, though it was not exactly like cotton candy. I will have to explore other flavor oils and extracts from this brand because I am just not a plain vanilla person. For the frosting, I decided to go with a homemade buttercream. I had a fridge full of different kinds of butter from Chef Shamy so I gave the Honey Butter Vanilla Bean a whirl. Chef Shamy serves up a high-quality butter with no weird ingredients… just pure butter. It is also gluten-free. This particular vanilla flavor produced the most glorious buttercream I have ever whipped up. I used Simple Truth Organic Powdered Sugar with the butter and a few splashes of almond milk. The flavor of this buttercream was out of this world. If I had to give myself a grade it would be an A+. It really was that great! Now let’s get on with the color. Yes, this time around I was naughty and used artificial colors… GASP! It’s true that I did. I’m not proud but sometimes you gotta do what you gotta do and YOLO! I used Betty Crocker’s Neon Gel Food Colors for the pink and the purple. Gel food coloring is some pretty potent and powerful stuff. They really do produce gorgeous coloring on your creations. I don’t know why but for the neon pack they do not include the color blue, so for that, I used a Kroger brand neon blue. I am so pleased with how the colors turned out! And for that gorgeous candy that is all over the cake? I created my own mix of sprinkles with several different brands. The sprinkles with the big bits are pieces of candy that were from Celebrations By Frey. My local Kroger store sells them but I can not locate them on Amazon. The bottle of sprinkles is titled MixLicious. I am super duper pleased as pie (or should I say “cake”) with how this cake turned out and I was proud to serve it to my family. It really did taste as good as it looks. I am not a professional baker so I am aware that the cake is a little sloppy but I am always working towards bettering myself as a chef and as a baker. This cake was so incredibly fun to make with my daughter and I could do this every single day if I had the funds (and if I wanted to be on 600lb Life). I am going to definitely be working on more cakes in the future and I might even get brave and give fondant a try. I love the way fondant cakes look. They are edible art! The beautiful cakes that I see on Instagram and on food blogs are so inspiring. So tell me… what is your favorite flavor of cake? Leave me a comment and let me know. Would love to hear from my readers. Comments always brighten up my day. 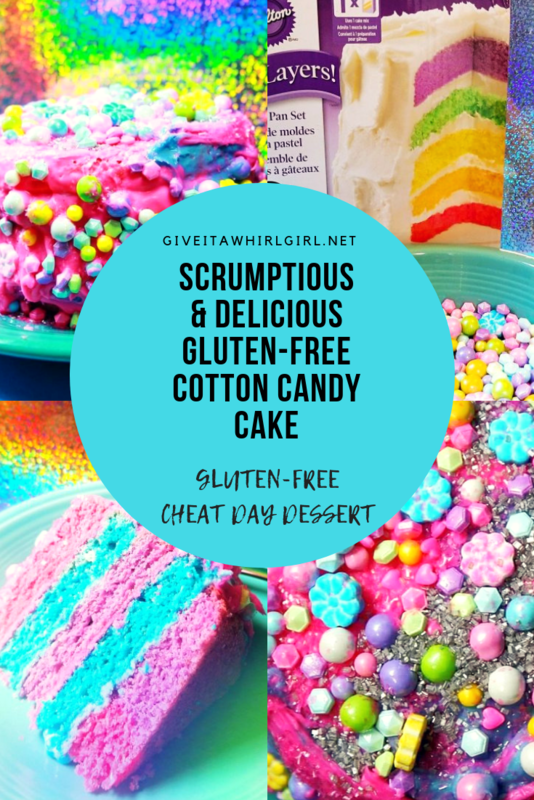 Find out more about the brands I used to create this cotton candy cake! This entry was posted in My Cooking Journey, Product Reviews and tagged baking, baking tools, betty crocker, buttercream, cake, cake mix, candy, candy sprinkles, cheat day, chef shamy, Chloe, colorful, cotton candy, dessert, food colors, frosting, gluten free, hot pink, lorann oils, pamelas, vanilla, vanilla butter, wilton. Bookmark the permalink. Looks amazing, great job. I would have loved to taste it. I hate to say it but it is almost gone. Oops!! This is the most beautiful cake ever!! I totally feel inspired to go try and bake an amazing layer cake now! Aww thanks! Go for it! I am loving baking more than cooking these days. I wish I could bake cake everyday!